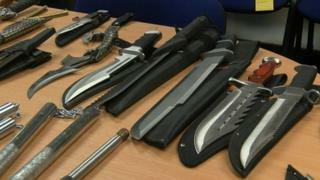 The true stories of teenagers who have been stabbed are being used in a new campaign to reduce knife crime. The £1.35m series of advertisements, funded by the government, will run on social media and digital channels and are aimed at 10-21 year olds. A dedicated website - called #knifefree - has been set up to provide advice and suggest support services. In their own words, here are three young people who have cut themselves free from a knife-carrying mindset. "All I remember is falling to the ground"
"When I was growing up my best friend died aged 12 from being stabbed. It changed my perspective of what the world was about and I started carrying a knife for protection. "One day I got into an incident when I had my knife. All I remember is falling to the ground from being stabbed. My whole life flashed before my eyes. "I remember lying there with my girlfriend holding my hand and thinking there were so many things I had not done and not achieved. "And that's when I realised I don't need to carry a knife." "I woke up in hospital. It hit me hard"
"When I was growing up my dream was to be a footballer, but I started hanging out with bad people who were selling drugs on the streets. My friend gave me a knife. I wanted pride. "We went to a party and my friend got into an altercation with another person and I tried to stop it but I got stabbed five times. "I woke up in hospital. It hit me hard. "I had so much talent, things had to change. I came out of hospital and really focussed on football. It was really tough - I could hardly kick the ball. "But as I recovered I became stronger and now I'm on a path to achieving my dream." Patrick Green, chief executive of the Ben Kinsella Trust, said it is "vitally important" young people understand the dangers associated with carrying a knife. "A knife won't protect you, it doesn't give you status. Harming or stabbing someone isn't a trivial act. "We need to do more to help young people understand that carrying a knife doesn't solve anything, in fact all it does is increase the likelihood that you will be imprisoned, seriously injured or murdered." "Take a step back from the madness"
"When I was young I was put into care and I had to grow up very quickly. I started hanging out with older people and they were carrying knives. "I felt safe when I was around them. I felt protected. "Then one day I was out with my friends and we saw a group of guys repeatedly stabbing this boy who lay on the floor. I later found out he had died. "I was affected very deeply by it but I felt I couldn't talk to anyone. It made me realise I could never carry a knife. "You have to take a step back from the madness and think 'is it worth it?'". As well as the digital adverts, posters will be on display in English cities where knife crime is more prevalent. Home Secretary Amber Rudd said the "emotional stories" were chosen to "bring home in powerful fashion just what a far-reaching impact it can have on a young person's life if they make the misguided decision to carry a knife". Victoria Atkins, the minister for crime, safeguarding and vulnerability, said the new campaign aimed to "highlight the tragic consequences of carrying a knife and challenge the idea that young people are safer if they carry one".